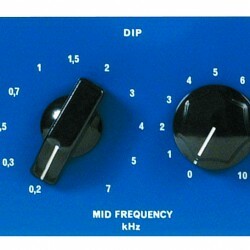 The TUBE-TECH ME 1B Midrange Equalizer contains a low frequency boost section for peaking, a mid frequency attenuation for dipping as well as a high frequency boost section for peaking. The filter section is of the the passive type followed by a tube based push-pull amplifier to restore the gain. Input and output are balanced and fully floating. Input and output transformers come with a static screen between the primary and secondary wirings. Height: 2 units 88 mm 3.5"
Net: 3.8 kg 8.4 lbs. Shipping: 5.6 kg 12.3 lbs.